UTI and Tata Mutual Fund have announced changes in their schemes’ categorization. Find out if your scheme is going to be revamped. When SEBI released a circular instructing all the mutual funds to be ‘true-to-label’ in the month of October last year, it raised the eyebrows of the mutual fund houses. The industry seemed to be concerned about the confusion it may create among the investors. However, the mutual fund houses are bound to change the names and fundamental attributes of the schemes which are not in line with the new rules that support one mutual fund under each category. Consequently, all of them are busy in the process of renaming, re-categorizing or merging/terminating their schemes since the beginning of 2018. The steps have been taken to ensure that their schemes share uniform characteristics with the category. 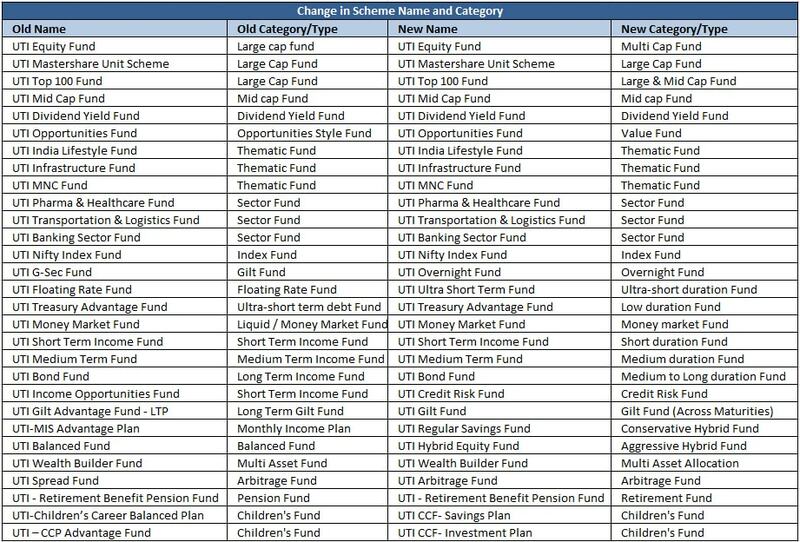 Following the trend, UTI Mutual Fund has a large list of renamed or re-categorized schemes. It has also merged a few schemes so as to align with the SEBI’s new rules of categorization and rationalization. The fund house has been supportive of the SEBI’s norms as this will help investors by reducing the confusion between the categories. Here is the list of known changes in the names, categories and mergers of the schemes of best UTI Mutual Fund. The updates will be effective from May 3rd, 2018. Backed by one of the most trusted brands, Tata Mutual Fund is also going to redefine the categories of its schemes to abide by the SEBI’s directives. The new categorization may reduce the number of schemes as well as their expense ratios because of the higher AUM per scheme. The list below contains the details about the modifications in the scheme names and categories of Tata Mutual Fund which will be effective from May 3rd, 2018. Till now, the fund house has not announced merger of any scheme. For further changes and updates from the mutual fund companies, stay connected with MySIPonline.